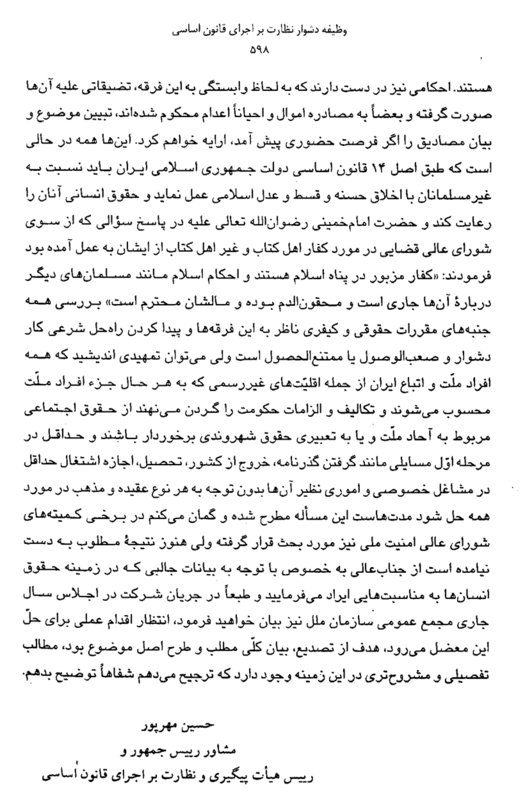 In a letter to Mr. Seyyed Mohammad Khatami, the Iranian President at the time, Mr. Hosein Mehrpour, the Chairman of the Board of Monitoring and Pursuit of the Implementation of the Constitution, discusses the dilemma facing the minorities, especially the Bahá’ís, with respect to their social rights. Referring to statements made by the President about human rights, and with respect to Article 14 of the Constitution, he calls for practical action toward resolving the rights of unrecognized minorities as citizens of Iran. 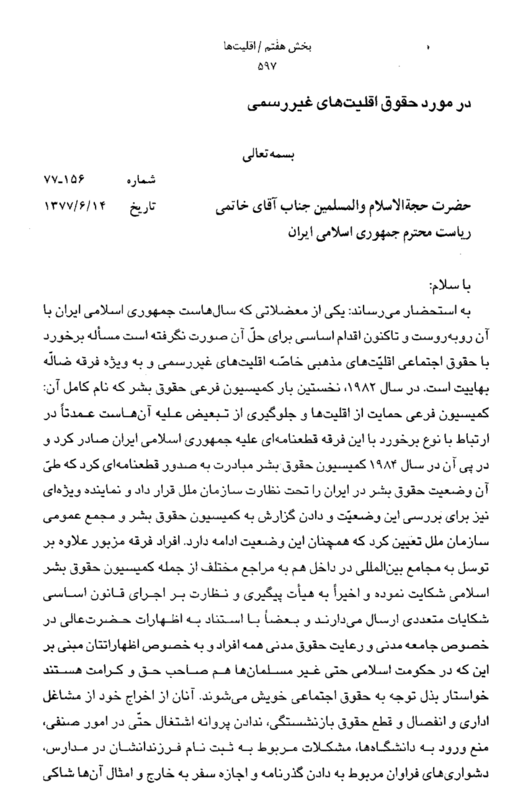 In this letter, Mr. Mehrpour asks the President to take initial steps to resolve such problems as obtaining passports, rights to education, and rights to employment in the private sector. This is to inform you that one of the issues facing the Islamic Republic of Iran for years, for which no steps have been taken to resolve, is addressing the civil rights of religious minorities, in particular the unrecognized minorities, specifically the misguided Baha’i sect. In 1982 the UN Sub-Committee on International Human Rights, the complete name of which is The Sub-Commission on Prevention of Discrimination and Protection of Minorities, passed a resolution condemning The Islamic Republic of Iran mainly for the mistreatment of this sect. Subsequent to that in 1984 the Human Rights Commission passed a resolution placing Iran’s human rights situation under the supervision of United Nations and appointed a Special Rapporteur to investigate and give a report to the Human Rights Commission and UN General Assembly which is still in effect. Apart from appealing to the International Community, the members of the said sect also complained to various authorities in the country including the Islamic Human Rights Council. They recently sent numerous complaints to the Committee for Monitoring the Implementation of the Constitution. They appealed to Your Highness’ statements on civil society and civil rights for all people. In particular they refer to your remarks concerning the fact that under Islamic government even the non-Muslims have civil rights and human dignity and thus seek further consideration of their civil rights. They complain about their dismissal from public service, the suspension of their pensions, the inability to even get trade certifications, the prohibition to enter universities and issues concerning registering their children in schools as well as numerous difficulties in obtaining passports and permission to travel outside of the country etc. They also have court orders indicating that they have been persecuted as a result of their adherence to this sect. Some were sentenced to the confiscation of their property and possibly sentenced to death. I will explain this issue and share the related instances when I get an opportunity to talk to you in person. To review all aspects of the civil and the criminal provisions related to these sects and finding a Shari’a legal solution is difficult or rather impossible to achieve. However, provisions should be made so all the Iranian citizens including the unrecognized minorities who in, any case, are considered as a part of this nation and abide by the duties and obligations of the government, enjoy the same civil rights which all other citizens have. In other words, they have civil rights, at least, in the first stage, for issues such as obtaining passports, leaving the country, education, authorization to work, at least in the private sector, and such matters which are to be resolved for all regardless of religion and belief. It has been a long time that this issue has been raised and I suppose it has been also discussed in some committees of the Supreme National Security Council. However the desired result is not achieved. Given the very interesting statements you make about human rights on different occasions which you will, no doubt, refer to during the meeting of this year’s UN General Assembly, it is expected of your highness to take practical steps to solve this problem. The purpose for this inconvenience is just to give a general overview and articulate the main issue. There are more detailed and comprehensive materials in this regard that I prefer to explain to you in person.